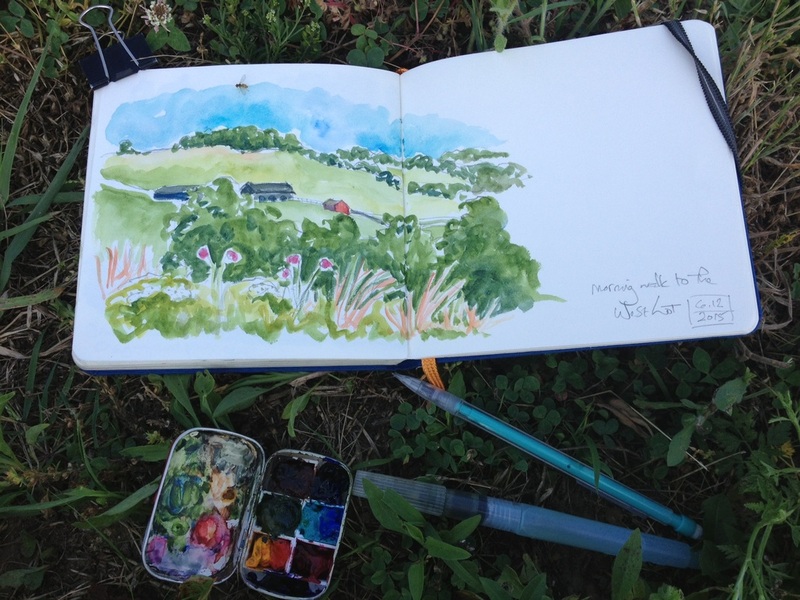 I drove up to Kentucky on Thursday and spent that night and most of Friday at Shakertown with my sketchbook (and banjo) for company on my way to meet friends and sisters at a dance weekend. Shaker Village at Pleasant Hill (to give it its full name, though the locals and highway signs all say Shakertown) is one of my favorite places in the world. The buildings are mostly early 1800's, and they have been beautifully restored. It sits on a ridge with a view out over the blue Kentucky hills, and it's one of those places where nature and craft have combined in complete and beautiful harmony. I went to school just down the road at Centre College, and it's been a special place for me ever since. I come occasionally to paint and enjoy the place, and even more occasionally when I'm at a transition place in life and need a safe haven for a few days to think things through and find some peace. It's the perfect sanctuary spot for any occasion. I got in tired on Thursday night and only did one sketch that evening as I walked the village. Afterwards I took my dinner and banjo out to a solo chair situated far enough away from the buildings for me not to be a nuisance to the other guests, and I sat and watched the hills in the distance, the lightening bugs dancing, and the stars coming out until bedtime. Utterly peaceful. Friday I spent most of the day sketching before I had to be in town for the dance that evening. I started with my morning walk out to the West Lot. I love walking the mile or so over to the further flung farming area. The road is along the ridge line with gorgeous views off into various bits of the surrounding area, and just at the apex, you can look down and see the Shaker barn buildings you're heading for. Shaker settlements usually had several different "family" areas. They were a celibate religion, but they took in converts, needy people, and lots of orphans and poor children (sometimes with the parents suing to get them back from Shakers who needed young people to help keep the community going). Everyone was organized into "families." At Pleasant Hill, there were large family dwellings for the East Family, Central Family, and West Family. Family groups would have their own outbuildings, kitchens, and meeting rooms for daily worship. There was a central meeting room for weekly worship with everyone, a Trustee's house (now a lovely restaurant) for business with the outside world, a post office, as well as a couple of smaller farm clusters of outbuildings, including the West Lot. I treated myself to a lovely lunch in the dining room (above right) ahead of my dancing all weekend. My family used to come visit me at college, stay at Shakertown, and take me to dinner there. Happy memories. Below is the East Family dwelling, with the narrow, stone sidewalk that runs the length of the village. There's something both beautiful and powerful about that simple line to me. I love walking on it and thinking of the feet that have passed before mine. It's such a tangible link with the people who built this lovely place. 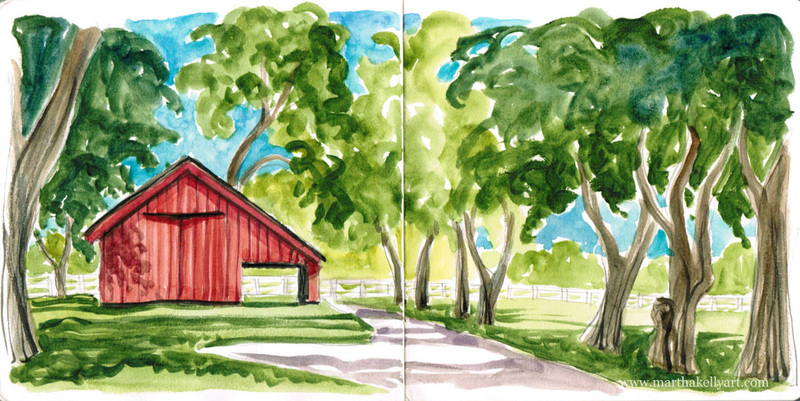 I finished up with a sketch of one of my favorite buildings, the funky red carriage barn. I always end up painting or drawing this when I'm in the village. I'm continuing to enjoy my tiny Altoids tin watercolor kit and water brush. I used them for all of these paintings. It's such a quick, minimal-set up way to paint. I feel like my whole world has changed with that option. It's so easy to just do a quick sketch now.